During an active service career spanning over three decades ‘Bordein’ served the Turco-Eygptian (Khedivial) administration (1869-1885), the Mahdist regime (1885-1898) and the Anglo-Egyptian Condominium Government (1898-1906). Built by Samuda Brothers of Poplar, London in c.1865 (machinery by J Penn and Sons of Greenwich), she was shipped to Egypt in sections and assembled in the dockyard at Bulaq. During her period of Khedivial service ‘Bordein’s most spectacular operation (prior to the siege of Khartoum) was the dramatic last-minute rescue of Romolo Gessi, one of Gordon’s lieutenants, from the grip of the Sudd in January 1881. During the Mahdist siege of Khartoum (March 1884 – January 1885) Bordein and her sister ships, none of them larger than the ‘penny steamers’ on the Thames, were converted by Gordon into very effective gunboats, protected by ‘armour’ of upright wooden baulks. Bordein was constantly in action on the Blue and White Niles, as well as on the main river. Although frequently hit by enemy fire, she was quickly repaired. After travelling back and forth between Khartoum and the four steamers that Gordon had sent to Metemmeh in September 1884 to await the expected arrival of Stewart’s Desert Column, Bordein was eventually ordered to join them on 15 December 1884. When the British forces arrived, Sir Charles Wilson set out in the Bordein, accompanied by the Tel El-Howein, in a desperate but unsuccessful attempt, to reach Khartoum and contact Gordon. On learning of the fall of the town, the steamers immediately turned downstream, but both struck rocks, probably accidentally, the Bordein near Mernat Island. After an overnight journey downstream, Lt Stuart-Wortley arrived at Metemmeh at dawn on 1st February. Later on the same day, Lord Charles Beresford set out in the SAFIA and, despite being temporarily immobilised by a direct hit on the vessel’s boiler, succeeded in rescuing Wilson and his party. The abandoned Bordein was later recovered by the Mahdists, repaired and then incorporated into their ‘navy’. 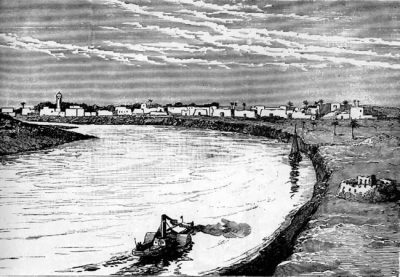 Among the operations in which she participated during her Mahdist service was an unsuccessful expedition up the White Nile in 1888 to crush Emin Pasha. Bordein was eventually recaptured by Kitchener’s forces on the first day of the action at Omdurman in September 1898. She was briefly employed in carrying troops and later for transporting building materials between Omdurman and Khartoum. Taken out of service in 1906 as being uneconomical to operate because of her enormous wood burning consumption, she was laid up and gradually deteriorated. However, in 1930 Bordein was restored to original state at the time of the siege and on 26th January 1935, the fiftieth anniversary of Gordon’s death, she appeared dressed overall opposite the Governor-General’s (now the Presidential) Palace. Thereafter, she became a winter tourist attraction, but sadly over the years, she began to deteriorate and eventually fell into complete disrepair. Stripped of her engine and boilers, her hull laid in the dockyard at Khartoum North. In 2011, following representations by the Melik Society over many years, the hull of General Gordon’s side-wheeler Bordein was finally rescued by Sudan’s River Transport Corporation from the Khartoum North Dockyard, and moved to a heritage site on the bank of the Nile near the old Omdurman fortifications. The hull sections have since been reassembled, and a complete restoration is under way. Bordein was originally built by Samuda Bros. of Poplar in 1869 and assembled in Cairo for Sir Samuel Baker’s 1871 Nile Expedition. She will become a major attraction for British and other visitors. The Society is proud to have played its part in preserving this unique steamer for future generations.